In North America when the leaves start to fall and the days get shorter, many birds head south for warmer weather. Only a small number of species stick it out for the winter. If you’re out in the woods in a typical February, it’s a pretty quiet place. But every once in a while, something unexpected happens. Hundreds or thousands of birds of a single species leave Canada’s boreal forests and move far south of their typical ranges in a phenomenon called an irruption. These irregular movements are big events for birders and wildlife biologists. This year an especially adorable species is irrupting: the Red-breasted Nuthatch. Nuthatches are small songbirds that feed on seeds and insects. They get their odd name from their habit of using their sprightly upturned beaks to pry back pieces of tree bark for stashing seeds. These jaunty little blue-gray birds with rusty-colored bellies and bold black eyebrow stripes are showing up far from their usual winter range along the Canadian-U.S. border, from Los Angeles to Tampa. Much of what we know about irruptions is based on data from long-running citizen science projects. These initiatives collect crowdsourced data produced primarily by nonprofessionals – in this case, birders and nature lovers. We are both professional ornithologists and active citizen scientists, and are following reports of Red-breasted Nuthatch sightings across North America. In addition to insights about this charming species, citizen science data on events like this may help us understand how climate change is affecting bird movements and forest health. Scientists have been trying to solve the puzzle of irruptions for decades. These irregular winter migrations are difficult to study because it is hard to predict when they will happen or where the birds will go each year. In each case, however, irruptions follow some type of boom-and-bust cycle of food sources. The most common cause is a phenomenon called “masting,” which occurs when a single tree species produces a large number of seeds across thousands of miles of forest in the same year. When the conifers in the boreal forests of Canada and the northern United States experience a masting year, the abundance of seeds gives some species of boreal songbird a boost. The birds can begin breeding earlier than usual and produce more offspring, resulting in a bird population boom. When fall arrives, the bird population has doubled or even tripled, but the available habitat hasn’t. Many birds move south, and young birds in particular may be pushed farther and farther, so people outside the boreal forests may start seeing unusual winter visitors at their feeders. For species of birds that seem to be influenced by masting, such as Red-breasted Nuthatches, Common Redpolls and Evening Grosbeaks, the year’s cone crop can be used to “forecast” winter bird outbreaks. The true cause of masting is unknown, but it typically occurs one to two years after a warm, dry spring. Often a masting year is followed by a poor seed production year. When weather patterns oscillate across the continent, the poor seed years that follow masting events can push birds out of one area, while good seed years in an adjacent region may attract them, leading to large-scale patterns of bird movement. As climate change alters weather patterns, changes in the frequency or intensity of masting are having trickle-down effects on many types of animals that depend on those seeds. Irruptions thus may provide insight into changes in the climate that affect boreal forests. While masting in conifers occurs every two to three years, other cycles of food excess happen on larger time scales. In the 1970s Canadian boreal forests experienced an outbreak of spruce budworm. The spruce budworm is a small caterpillar that eats conifers and experiences outbreaks roughly every 20 years. While budworms decimated spruce forests, birds gorged themselves on budworms. As a result, populations of Evening Grosbeaks and Purple Finches exploded. Similarly, a major Snowy Owl irruption in 2013-14, which extended as far south as the Bahamas, appeared to be connected with a huge increase in the population of lemmings, the owls’ favorite food source. In response scientists created “Project SnowStorm,” fitting several young owls with radio transmitters so they could follow them across large distances and learn more about this enigmatic bird’s lifestyle. Citizen scientists are a crucial asset for studying irruptions. Novice and expert bird-watchers across large areas can accurately capture the extent and timing of bird movements. When flocks of Red-breasted Nuthatches are spotted in the southeastern United States during the winter, scientists know in real time that an irruption is occurring. Project FeederWatch in North America and the Christmas Bird Count and Great Backyard Bird Count worldwide are all citizen science initiatives that monitor bird populations during the winter. They complement North American Breeding Bird Surveys, which are conducted by citizen scientists and professionals in the spring and summer. Conveniently, everyone can participate in Project FeederWatch and the Great Backyard Bird Count from the comfort of their own homes. Many wintering birds readily come to feeders, and their energetic flights provide hours of entertainment, while the counts provide scientists with important data. In 2016 more than 160,000 checklists were submitted for the Great Backyard Bird Count. Approximately 150 scientific papers have been published since 1997 using the Cornell Lab of Ornithology‘s citizen science data to document phenomena such as changes in birds’ wintering ranges. 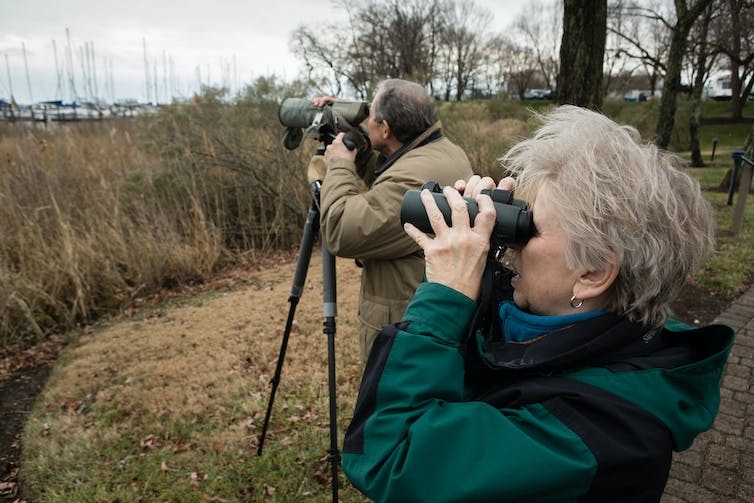 The National Audubon Society‘s Christmas Bird Count began over a century ago and has grown from a few dozen people to tens of thousands of participants. Many academic researchers and wildlife agencies use the data to learn about long-term population trends that influence management and conservation decisions. Researchers also use daily bird sightings from eBird, a website for uploading bird observations. Anyone can contribute information, and the data are free and publicly available. During the upcoming Great Backyard Bird Count on Feb. 17-20, 2017, participants will identify and count birds for at least 15 minutes or as long as they like from anywhere. There are no set routes, unlike the Christmas Bird Count, and volunteers just need to upload their counts to the website. Long-term, large-scale censusing projects like the Great Backyard Bird Count continue to increase our knowledge of bird migration. This year’s data will tell us more about the nuthatch irruption and long-term changes in bird populations. Visit elsevier.com to access content on avian patterns, biodiversity, conservation and more! Use discount code STC317 at checkout and save up to 30% on your very own copy! The science of living things holds a special fascination for human beings, as we strive to understand our place in the seemingly endless array of life on our planet. Research into agricultural and plant science, ecology, animal science and behavior, aquatic and marine science, organismal biology, entomology, and evolution continues to shape both our technology and our fundamental knowledge of ourselves. Elsevier’s foundational and leading-edge content in these areas — including award-winning encyclopedias of fish physiology, animal behavior, and insects — continues to enhance scientific comprehension of the living systems we depend on. Scientists at Work: Observing Termite Behaviors, Personalities.. and Souls? Does Eating Bamboo Make it Harder for Pandas to Reproduce?